Will we walk our talk, and demonstrate our Aloha in 2010? Can we do so with wild success and joy? The year ahead is a clean slate, and we can have it be whatever we wish it to be. Like I imagine many managers are, I have been immersed in strategic planning these past few weeks, drawing up detailed plans for what my 2010 business strategies will be. I am excited about what I have put together, feeling it will energize me, will serve others, and will express my personal Ho‘ohana (intention with worthwhile work) in a meaningful and rewarding way. So now I am thinking bigger —about all of us as a community, Kākou (inclusively), and about what collaborative objective we could share throughout the coming year no matter what our individual work may be. I keep coming back to Aloha because I think it’s gone missing a bit too much, and I feel us yearn for it. Can we make it remarkably real? Can Aloha become a palpable physical presence for us in the coming year, more than it’s ever been before? We need a comeback of better service, person to person, with human graciousness experienced in every single encounter we have with each other. They are encounters where Ho‘okipa (unconditional hospitality), Lokomaika‘i (generosity of good heart) and Aloha (as an expectation of good spirit, even in strangers) combine, mix virtuously and nourish us. It’s amazing: When we have Aloha present, we don’t need that much more. When Aloha is shared between us, it grows in an exponential way: It becomes more. It satisfies needs we ache to have soothed, and it heals others we weren’t even aware had started to hurt. We need not clutter up Aloha either, with caveats, rules and scripts: It is perfectly stellar on its own. I have a favorite self-coaching (you’ve read it here before): Life is not a solo proposition; we human beings were not meant to live alone. This enlarging of ‘Ohana is something I have had to learn, and it remains something I have to better learn every single day. Let’s keep that kind of relationship-strengthening learning alive and well too; investing our energies in Aloha is not something we need do alone. Of this I am sure: Aloha is a source of better health. When we feel less than completely healthy in life, we know that it is a red flag: Aloha has gone missing somewhere in that life. No more ignoring the red flag (and no more throwing in the towel). In 2010, let’s get Aloha healthy and watch it infiltrate everything else as the good contagion it is. Aloha is an all or nothing kind of thing: You have to go ‘all in.’ There must be alignment between Aloha and all your other values. There must be alignment between Aloha and your verbs — all the actions you take, whatever they are. As a result there will be another ‘V’ — Verve. Vitality. Vigor. There will be the energy for everything else you wish to achieve. This is my mana‘o, and I am happy to share it with you, however know you can do this in your own way too, and as Aloha speaks to you. “With aloha” is how so many of us will end emails, cards or letters, and sign off on much of the correspondence we do — I know I do; it’s been a long-standing habit; part of my Hawai‘i signature of sense of place. It has something we feel we are blessed in being able to write, and say universally, whether we live in the islands or not. No more salutation without authenticity. 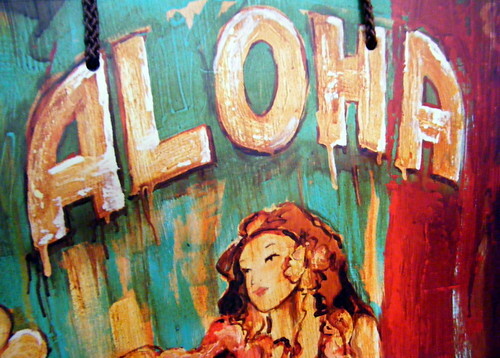 Starting today, let’s not write “With aloha” or say “With aloha” unless we mean it. However let’s mean it so we CAN write it and say it every day, and all the time. Don’t wait for someone else. The only way you get Aloha, is by being obsessive about being the first one to give it. Hau‘oli Makahiki hou ~ Let’s make 2010 the Year of Aloha. We will get what we choose, and what we give. See more of this letter art at Daily Drop Cap by Jennifer Hische. Mahalo for sharing it with your Aloha Jennifer! This is an “Almost Book Review” of Find your Strongest Life, What the Happiest and Most Successful Women Do Differently by Marcus Buckingham. I’ve read it cover to cover, but I’m not finished with it enough to completely review it, and that’s the point of this post. Explanation coming up. Whether you are male or female, let’s talk story about the core premise of this book for a moment, okay? You can find your strongest life, and 2010 may be your golden opportunity. As trumpeted on his book jacket, “Marcus Buckingham is the go-to consultant for people and organizations wanting to leverage their strengths” and in the process, make their weaknesses irrelevant. He continues to write books that are very useful to his readers IF, —and this is a big ‘if’ —you’ll go the distance with taking his advice and make his book a study, not just a passing read. You must be willing, and disciplined enough, to become your own work in progress (something you can do privately, don’t worry) while diligently following his coaching-in-a-book. Unfortunately, many of us don’t do that. We finish a book, and the moment we reach the last word on the final page we feel just that – it’s finished. And so are we; we’re finished with it. Do savor your reading accomplishment and keep reaching for another book, and then another: Alaka‘i managers are readers for several reasons. However if you can’t break from that finished-without-study habit, it’s a bit hard to get from liking to loving this book (or any other non-fiction book for that matter, MWA is no different). You know what habits will do to you. Myth 1. As a result of having better education, better jobs, and better pay, women today are happier and more fulfilled than they were forty years ago. Actually, the opposite is true. Surveys of more than 1.3 million men and women reveal that women today are less happy relative to where they were forty years ago, and relative to men. Myth 2. Women become more engaged and fulfilled as they get older. No, men do. According to a forty-year study of forty-six thousand men and women, women begin their lives more satisfied than men and then gradually become less satisfied with every aspect of their lives— marriage, finances, things they own, even family. Hopefully, you male managers don’t want these truths to be self-evident in the women within your workplace either. I suspect I liked Find your Strongest Life to the degree I did, recommending it to a few people before I was halfway through it, because it was so much in alignment with Buckingham’s previous work, and it was sequential. It reinforced my prior strengths management studies with him. I’ve been a big Marcus Buckingham fan, have seen him speak and have met him, and I have read everything he has written. I study his books near obsessively, comforted by his research methods and trusting them, and I have enjoyed being witness to how his own studies and body of work has evolved. Therefore, it is highly likely that I expect more from him because I crave more, wanting to see what he will talk about next. I felt Find Your Strongest Life was filled with good stuff, and I relished what it contained, but I was left wanting more without being quite sure of what I still wanted —thus I continue to study it, and be my own work in progress. I’ve now read it through it completely once, and listened to it on audio, and my annotation/ journaling process comes next with a slower, second reading, syncing my progress with my Strong Week Plan and my Weekly Review. When that’s done, I will follow-up with a more in-depth review (as I do feel the book deserves). Meanwhile, I want you to start reading it too. Then we can talk more about it together. Still here guys? Hope so! I decided to talk about this now, because I know many of you are doing your strategic planning for the coming year, and MWA Key 7, strengths management, is a GREAT goal for Alaka‘i managers to work on. Do it for you, and then do it for your team, being their empathetic coach. Enroll in Buckingham’s mission, for this is what all managers need to do! If each Alaka‘i manager were to think of his or her view of “the world” as their workplace, we’d make a significant difference for so many people. 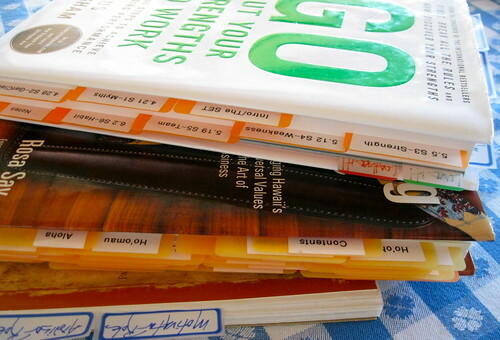 DO commit to working on your strengths in 2010. First time through, Find Your Strongest Life is a quick read: My recommendation to others, would be to plan on reading Go Put Your Strengths to Work, 6 Powerful Steps to Achieve Outstanding Performance as a companion to Find Your Strongest Life if you are interested in it (women) or instead of it (men). Business models will change in 2010: They must. Thus, you will be working on new work models too: You must if your organizational culture is to be its healthiest. Jobs will change: We are already being consumed by thoughts of new job creation, newly understanding how necessary they are to us as a healthy society. So why not do your 2010 redesign in alignment with your own strengths? It’s a golden opportunity! Strengths work, wherein you get better attuned to your own talents (and activities which energize you) is the easiest and best way to attain (or discover) your Ho‘ohana, especially if you are one who feels that “working on your passion” is too woo-woo and not pragmatic enough for you. In the process, you also get better attunded to your non-talents, and those activities which drain you: Strip them out of your business models forever, and have January 2010 be when you start. Any income made from our aStore on Amazon.com is used to fund our literacy campaign within Ho‘ohana Publishing, a Teaching with Aloha initiative. We purchase books and donate them to schools and workplace training programs committed to teaching within Aloha value-alignment.